Replace the forend on your Remington 870 with the Surefire 618LMG-A Forend LED Flashlight for added functionality. The light features 500 lumens of output, and has momentary and constant-on modes. The right side features a long momentary-on tape switch and system disable toggle switch, while the left side features a constant-on toggle switch. The disable switch helps to prevent accidental activation during transport, storage, or when strict light discipline is needed. The forend is made from an impact-resistant Nitrolon polymer and has a textured grip for secure handling. 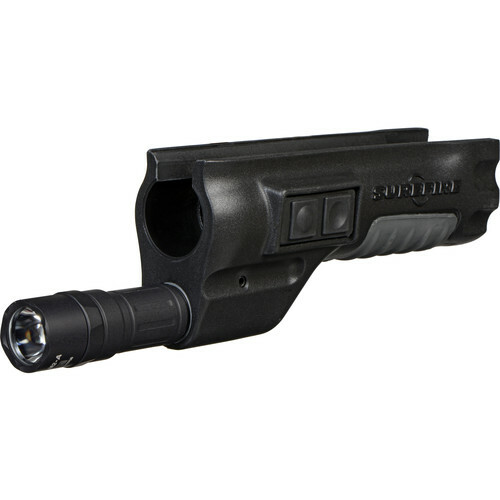 The light is made from machined aluminum with a matte black Type III MIL-STD anodized finish. SureFire's Total Internal Reflection (TIR) lens produces a pre-focused beam that has a tight center cone of bright light, with a dimmer ring on the periphery to help maintain situational awareness. O-rings and gaskets seal the light from water and dust. The two 123A batteries provide up to 1.75 hours of runtime. Box Dimensions (LxWxH) 10.3 x 3.7 x 3.6"